These 360° adjustable fan sprayers mounted on a 6” stake are designed to produce a vortex fan spray with adjustable flow rated from 0 to 19.5 GPH. Each fan sprayer has an adjustable cap that allows for simultaneous control of the flow rate and the wetting area. These drippers are very useful in residential gardens for an individual plant or group of plants, or for ground covers, shrubs, and trees. The adjustable fan sprayer offers a convenient way to water areas where conventional sprinkler systems are not suitable. This high quality adjustable dripper has a barb inlet mounted on a spike measuring 6" from tip to top, which allows for the insertion of 1/4" micro tubing onto the spike. The riser allows you to mount the adjustable dripper a few inches above ground. 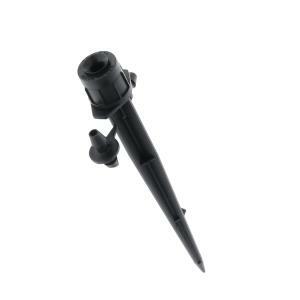 Includes an additional 1/4" barbed connector that comes attached to the stake for connecting your 1/4" micro tubing to your mainline.